Howard Webb has monitored water quality at Whitecliff Quarry Lake in Crestwood Park (St. Louis area) since 2007. His interest in zooplankton community structure led him to the LMVP where his ingenuity, critical thinking and technical skills have been tapped on more than one occasion. We're very fortunate to have Howard as a water monitor. What follows is the story of one of Howard's creations. Water quality professors have been measuring temperature at different lake depths for years, using either expensive equipment or an inexhaustible supply of student labor. Howard's idea was to deploy small, cheap electronic data-loggers to record the temperature at some specified time interval and retrieve them later all at once. The whole outfit would cost less than $200 and require minimal labor to deploy and retrieve. Thermochron iButton temperature data loggers are about the size of a watch battery and are used to monitor temperature-sensitive products during shipping, among other things. They continuously record the temperature at an interval that can be programmed by the end user. The data are then stored inside the unit to be retrieved later. The iButtons are attached to a rope with a float at one end and a cinder block at the other. This determines their distance from the bottom of the lake. An additional rope with a float at the end is attached near the top of the anchored rope (see figure, right). 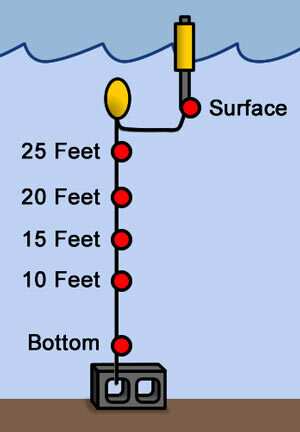 The purpose of the additional rope is to ensure the apparatus can be retrieved in high water and to allow for a surface reading regardless of the water level, however the distance between the surface measuring point and the next deepest point (25 feet from the bottom) will vary somewhat with water depth. Waterproofing the iButtons was a challenging task for Howard. The most promising initial design involved putting the iButton inside a plastic bag and placing the bag inside a plastic bottle. The bottle housing worked very well, until it didn't. Though the housing succeeded in keeping the contents dry, it was appealing to chewing rodents. Apparently, a muskrat mistook the algae covered plastic bottles for some sort of delicious food and chewed through all but one of them. 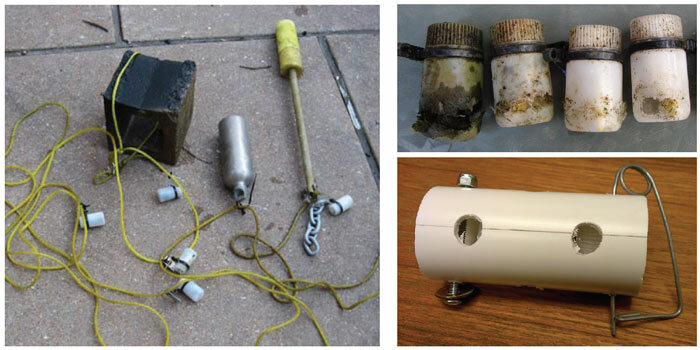 The data loggers inside were soaked or missing when Howard retrieved the apparatus. The newest design involves a length of PVC pipe surrounding the plastic bottle and will hopefully discourage gnawing. Data are retrieved from the units using a computer-connected device purchased with the iButton readers. Howard has deployed and retrieved the apparatus (it really needs a cool name!) 7 times since January of 2011. The data (see graphs below) show that stratification began around the beginning of March in both years. As expected, the surface temperature varied considerably from day to day as the lake warmed (top two lines – red) while the lower strata warmed slowly (bottom three lines – green and blue). Surface temperatures peaked around the end of July in both years. Interestingly, deeper water continued warming, even as the surface was cooling. 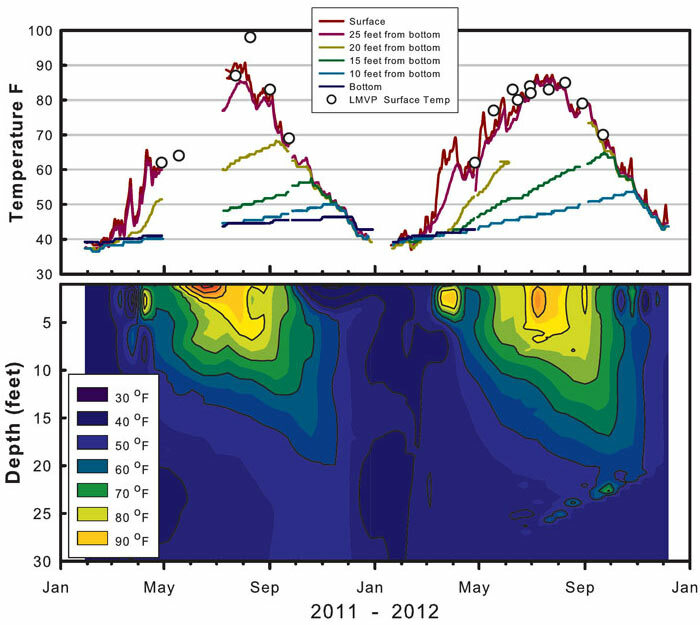 The deepest water (measured only during 2011 and early 2012) continued warming until December, when the lake finally mixed from top to bottom. There are a couple of Missouri lakes we suspect mix during the summer, and are likely to have issues with sediment resuspension. We hope to deploy these units in those lakes to find out for sure. One of the logistical problems will be finding a location that won't be accessible to vandals or otherwise curious people who might move the apparatus. Thanks to Howard Webb, we will be able to do it inexpensively and keep our student workers in the lab where they belong. Left: The sampling rig. Top right: the muskrat-chewed bottles. Bottom right: The new and hopefully muskrat-proof design. These graphs show average daily temperature in degrees Fahrenheit as recorded at various depths in Whitecliff Quarry Lake (Crestwood, MO). The TOP GRAPH shows the data as temperature vs. time. Each iButton has its own line. The BOTTOM GRAPH is an "isopleth" which shows temperature as color. The vertical axis is depth, with the water surface at the top. Depth was estimated to be 30 feet from top to bottom. Each day is a single, vertical "slice." Moving the "slice" across the graph shows daily temperature changes.